Product #46066 | SKU M5SK | 0.0 (no ratings yet) Thanks for your rating! 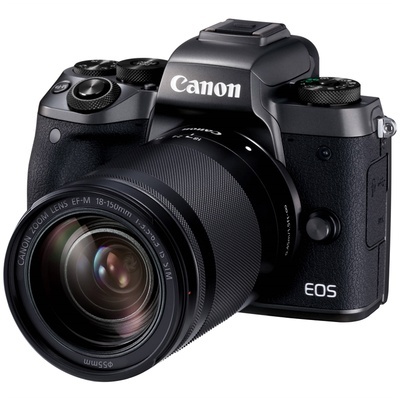 Adept in both stills and video arenas, the EOS M5 from Canon is a versatile mirrorless camera featuring a 24.2MP APS-C CMOS sensor and DIGIC 7 image processor. Combined, these technologies afford a wide sensitivity range, from ISO 100-25600, along with quick performance for up to 9 fps continuous shooting and Full HD 1080p/60 video recording. The sensor's design also provides Dual Pixel CMOS AF, which offers quick and accurate phase-detection autofocus for multimedia use. This focusing system is particularly well-suited to subject tracking, and pairs with Digital IS 5-axis image stabilisation for steadier, shake-free video recording. Included with the camera body is the EF-M 18-150mm f/3.5-6.3 IS STM lens; a wide-to-telae zoom providing a 28.8-240mm equivalent focal length range. Pairing well with the camera, this lens employs an STM motor for quick, smooth, and near-silent autofocus performance that benefits both stills as well as video applications. Its Image Stabiliser works in conjunction with the camera's Digital IS for more effective performance, and stabilised panning is also supported to suit working with fast-moving subjects. Both a 24.2MP APS-C CMOS sensor and DIGIC 7 image processor are used to deliver high sensitivity and fast camera performance to suit both stills and video applications. A flexible ISO 100-25600 range suits working in a variety of lighting conditions, and the processing capabilities minimise noise for notable clarity. The processor also contributes to a fast 7 fps continuous shooting rate, which can be quickened to 9 fps with AF lock, for photographing fast-moving subjects. Full HD 1080p video recording is also supported in 60 and 50 fps frame rates. Additionally, the processor affords a fast camera startup time and short interval times between each frame for a more intuitive and efficient shooting process. Supporting video applications, Digital IS with 5-axis image stabilisation minimises the appearance of camera shake for sharper handheld shooting. This benefits recording while walking or moving, and can also be used in conjunction with lenses featuring optical IS for more effective overall stabilisation. Physical controls allow for intuitive settings adjustments, and include a front dial, quick control dial, dial function button, and exposure compensation dial. Each of these can be customised to adjust specific functions for more personalised control.